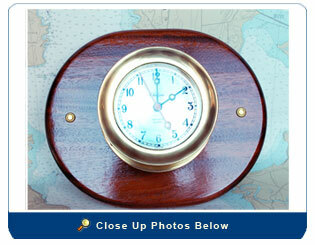 his is a vintage, solid-brass Chelsea ship’s bell quartz clock. 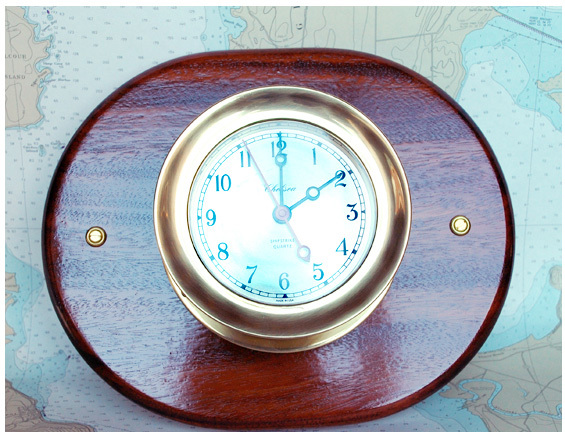 The clock keeps perfect time and rings the standard “ship’s bells” on the hour and half hour. When purchased it was quite tarnished therefore we feel it was used onboard. It was polished, buffed and sealed with a clear brass lacquer. Today, Chelsea sells these clocks new for $550.00 (with no mounting Board). Size: Face 5 ½” Diameter and the base is 11” by 9”.